Lydia’s doing the Free For All Challenge over at Splitcoast today. We’re to make something that resembles pixels on our cards, so I’ve embossed the corners of each of my squares to simulate pixels. And, our Queen for the Day is Carol. I’m honoring Carol with my version of this card. My card base is a standard A2 in SU Basic Black. Next I punched some squares out of a newsprint type designer paper, dabbed the corners with my Versamark pad and gold embossed each square. Then using a large sheet of Scor-Tape, the squares were all attached to the card base. The edge of the entire sheet was sponged with a little bit of SU Cherry Cobbler once it was adhered to the card. The same image that Carol used was stamped in Staz-On Black over top of the squares. Then some Copics were used to color the leaves and the berries. They were colored very carefully as Copics and Staz-On are both solvent-based and can smudge. 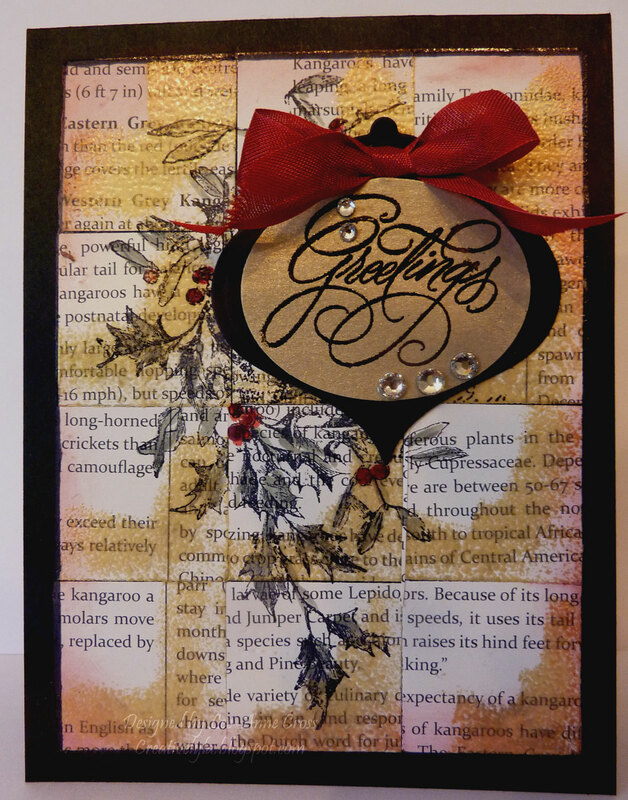 Next comes a die cut ornament shape, followed by a punched oval that has the sentiment heat embossed on it. A small SU Cherry Cobbler seam binding bow and a few rhinestones are the final touches on the card. Again, have a fabulous Friday everyone!